Viewing topic "Setting up the Motfif XF, Cubase and Windows 10 via FireWire"
I also posted these questions on YamahaSynth. My setup: I have the Yamaha Steinberg FireWire Audio/MIDI driver installed. I have Cubase AI 9.5 installed. Also, I have the Motif XF Editor installed along with the Yamaha Motif XF extensions. My audio interface sound card is the Mbox 3 Pro FireWire which I have my monitors connected to. I’m not so much interested in using the Motif XF on its own to record things. 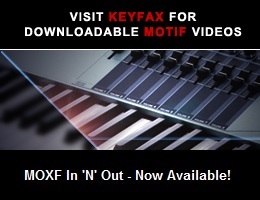 I want to record sounds, songs, patterns, performances and edit and control the Motif XF via Cubase and the Motif Editor. Basically, I want to be able to have a separate midi and audio track in Cubase from the sounds coming from my Motif XF whether I’m in Voice, Pattern, Song or Performance mode. Starting from square one, if someone has a list of things I should know for setting up and using my Motif XF via FireWire and Cubase on a Windows 10 PC that would be great. There’s a lot of info out there and so far, I’ve found bits and pieces of info that can help me but nothing specific to what I’m trying to do. Step by step instructions on how to setup my Motif and Cubase so I can send each of the 4 parts (voices, Arps) of a Performance Mode selection (i.e. Inner Wind) to separate tracks in Cubase having both a Midi and Audio track for each individual part/voice/Arp. This is so that I can record both the pure Audio from the Motif XF having the FireWire connection and the midi data on its own track in case I want to change something after recording. The same info for setting up my Motif XF with Cubase for a Motif Pattern Mode having both a separate Midi and Audio track for each part in Cubase. The same info for setting up my Motif XF with Cubase for a Song Mode on the Motif XF having both a separate Midi and Audio track for each part in Cubase. Thanks in advance for anyone taking the tome to give me guidance and assistance. Since I don’t use Cubase or Windows 10 myself, I hope others will join this thread and discuss related issues. I think you’ll find that first using Direct Performance Record on the XF, and then transferring the result to Cubase, will be the better approach. Thank you for taking the time to reply with the info below! I’m doing the best I can to piece together the info I’m learning.